You don’t have to deliberately talk like a pirate (Mark your calendar – International Talk Like a Pirate Day, September 19) to find yourself using expressions that are nautical in origin. I’d hear my parents, and their friends commonly use these figures of speech in ye olde seafaring town of Milwaukee, Wisconsin, which is situated about 2,200 miles distant from the Pacific Ocean, and 1,100 miles from the Atlantic. Nevertheless, both phrases were quite popular in my hometown, as well as just about anywhere else in America back in those days. Describing someone as being “three sheets to the wind” is to say he or she is in a serious state of staggering drunkenness. With the words “wind” and “sheets” in this expression, even as a little boy I sensed it had something to do with ships and sails, and based on whom my folks applied this phrase to, I also understood it had something to do with the consumption of copious amounts of alcohol. And then later as I grew older and began to acquire some firsthand experience with the devil’s lubricant, otherwise known as adult beverages, I guessed that “three sheets to the wind” described that exhilarating level of inebriation, when you feel as if you are really flying over the waves in a fast sailboat, with extra sails put on to catch the stiff wind at your back. You know, it’s when you feel relaxed, almost weightless, when you think you can do no wrong and have no harm come to you. Nope. That is not how the expression came about and not what it describes. In fact, sailors used “three sheets to the wind” to note the condition that occurs after that initial bliss and after crossing that line of quaffing several too many drinky-winkies. In other words, this idiom captures the experience of being in a state of stumbling, mumbling, bumbling drunkenness. 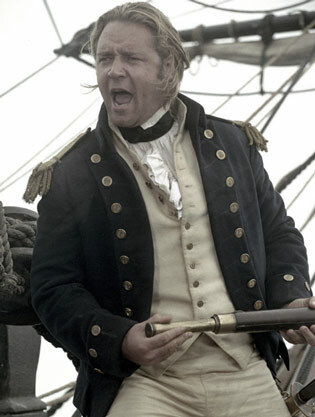 By the way, behind Crowe among the rigging you can see lines called “sheets” that are attached to some furled sails. It’s easy to see just how apt the above expression is because “sheets,” for sailors back then, wasn’t a synonym for “sails.” Instead,”sheets” was the word used for the lines that tied sails to a boom, bowsprit, deck, or sides of a ship. If one or more sheets broke or, as old tars would say, was “in the wind,” a sail would begin to flap erratically, causing the ship to wobble and lurch as if it were intoxicated. The more sheets in the wind, the less seaworthy the ship became, sometimes leading to a disastrous outcome for ship and crew alike. Sailors, observing a ship’s performance in this situation, set up an informal system to rate the levels of imbibedness. One sheet to the wind – still good company. Two sheets to the wind – getting boisterous. Three sheets to the wind – reeling from side to side, falling down. There used to be a “four sheets to the wind” rating, which is no longer referred to, maybe because it was too horrible to even contemplate. Different parts of a sailboat’s sail. To get to the origin of the above expression, we have to first, obviously enough, find out what a “jib” is. 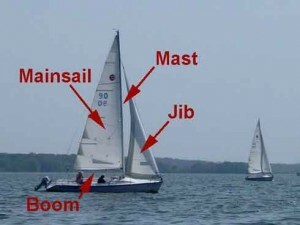 In the lexicon of sailing terms, a jib is a triangular sail that sets ahead of the foremast to the bowsprit or a boom. Small sailboats have one jib, large ships like schooners can be rigged with as many as four. 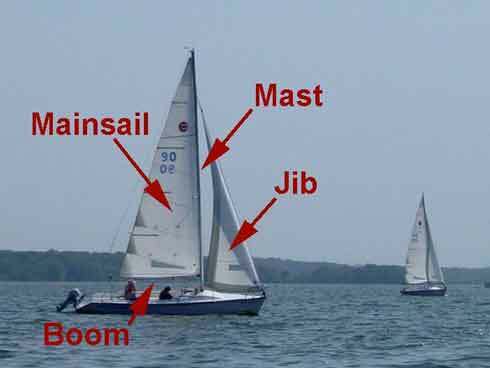 Apparently, back in the Golden Age of Sail, different nations favored different styles of jibs. According to Naval Chronicles (1805), sailors on deck were advised to note the cut of the jib of an approaching ship in order to help identify friend or foe. By 1824, novelist Sir Walter Scott used the expression in St. Ronan’s Well with the same meaning it has today – as a mark of approval. I wanted to end this contemplation on things nautical with a scene from one of my favorite classic movies – The Philadelphia Story (1940), starring Katherine Hepburn as a rich heiress, Cary Grant as her ex-husband who shows up at her impending wedding, and James Stewart as a photojournalist who is crashing the ceremony, with Cary Grant’s help, in hope of finding a scandalous scoop. Summarized in that way I’ve made the film sound like just another screwball comedy of the time. Which it is. But actually, it’s also a bracingly well-written, insightful, resonant, very adult romance about coming to terms with oneself as well as with the one you truly love. Hear Kate use a nautical term. “… She was yare… It means, uh…easy to handle, quick to the helm, fast, right. Everything a boat should be…” says Hepburn wistfully about the sailboat her ex-husband had designed, and in which they had sailed away on for their honeymoon. But she was also talking about a time in her life when she and Grant and the world were just right. What a guy. What a gal. What a movie! Well, excuse me as I reach for a Kleenex, I’ve seemed to have gotten something in my eye. While I take care of that, feel free to view another clip from the same movie, which has nothing to do with sailing, but which is a lot of fun. So, so long for now, matey. Fair winds and Godspeed. Arrgh! 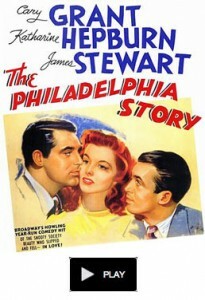 Watch actress Virginia Weilder, who plays Katherine Hepburn’s younger sister, talk French and sing “Lydia, the Tatooed Lady” in The Philadelphia Story. This entry was posted on Friday, August 2nd, 2013 at 1:21 pmand is filed under . You can follow any responses to this entry through the RSS 2.0 feed. You can leave a response, or trackback from your own site. Thank you for this! I came here for the definition and background of ‘the cut of your jib’, but it has reminded me of three sheets to the wind as well! Excellent. Beautiful site with some well-written and humorous content to boot. Excellent description and site!!! Thank you! A great explanation of two lovely and very colourful expressions. I love it! I’m so pleased to have stumbled across this site. Thanks for your excellent explanation of both phrases – I’ll use them now with underpinning knowledge! Thanks for the catch, Katy, regarding the correct name of the Hepburn/Grant movie, and I have made the correction. Actually the word “yar” is a variant spelling of yare”, and it appears in this form in IMDB’s “Quotes” section regarding the film. On, Cheers, an American sitcom that ran from 1982-1993, Season 6, Episode 5, “The Crane Muninity”, the guys told Fraiser “Rebecca likes the cut of your jib”. Fraiser replies with “Well, the Cranes have always been know for their jib”. I thought it meant, Rebecca liked Fraiser’s body. Wanted to know exact meaning and orgin.